Startups create most of the job opportunities in the Arab World, therefore, incubating and supporting them is crucial for the economic development and prosperity. Lebanon is no exception to that where talent, quality education, and potential is abundant but not exploited enough to boost the economic productivity. 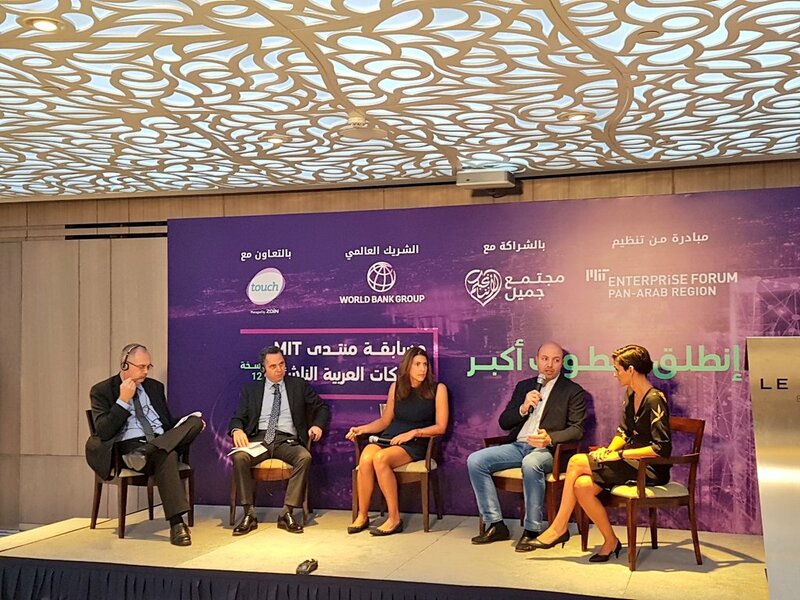 In this context, the MIT Enterprise Forum Pan Arab announced, in a press conference held on September 27 at Le Gray Hotel in Downtown Beirut, the launch of the 12th edition of the Arab Startup Competition. The conference was attended by Jamal Jarrah Lebanese Minister of Telecommunications, Emre Gurkan CEO of Touch Telecom, Paul Welton Lead Governance Specialist of the World Bank Group, and Hala Fadel Chairperson of MITEF Pan Arab, in addition to several high caliber attendees. Choosing Beirut as a host city for the final ceremony at this particular time comes out of a strong belief in Lebanon and the ability of its community and economy to transcend hardships and challenges. It is an expression of the Forum’s confidence in the willpower of the Lebanese youth who is determined to move towards new horizons of investment, innovation, and entrepreneurship. The participating teams are selected after going through different rounds of judging, leading to the final qualifying round where three teams are selected from each track to take the first, second, and third place. The winning teams will benefit from different prizes valued at $160,000 in addition to training, mentorship sessions, exposure and networking opportunities with investors. The final event will take place over the course of two days in March 2019 with the participation of 80 semifinalist teams from 20 different Arab countries; approximately 160 entrepreneurs will receive the chance to network with over 400 attendees, 120 of whom are top level regional and international executives, mentors and investors. Among the attendees are also over 20 representatives from private funding companies as well as governmental entities and other stakeholders interested in supporting Lebanese and Arab Startups. The Lebanese teams’ participation has been remarkable throughout all the editions of the Arab Startup Competition which indicates the unparalleled ambitions and unique ideas of the startup scene in Lebanon. In the past three editions, the number of participating Lebanese startups that reached the final rounds has multiplied. In the 11th edition, a Lebanese team took over second place in all three tracks. For eight consecutive editions, Lebanese based startups have received around 235,000 USD in award money from the competition. World Bank reports indicate that since 2009, 12 more startups are established annually in Lebanon as compared to the previous years resulting in a 24% compound growth rate in startup creation. Lebanon has recorded a 56% growth rate in the number of investments where a total of 162 deals were closed between 2013 and 2017, ranked second after the UAE in terms of the numbers and value of deals in Millions of dollars in the MENA Region. The support of the Central Bank has had a significant impact on the growth rate in terms of initiatives known as Circular 311 aimed at providing a capital injection of over $400 million into the Lebanese entrepreneurship ecosystem. In 2016, circular 419 was issued allowing banks to invest up to $600 million collectively in Lebanese tech startups. These initiatives have proven to be successful and have achieved evident results despite the overall challenging circumstances faced by the ecosystem. It is enough to imagine how impressive the results would have been had the ecosystem experienced more stable circumstances that stimulates and incubates the youths’ entrepreneurial dreams. This is what the Arab Startup Competition is all about where every idea and project is a potential success story.